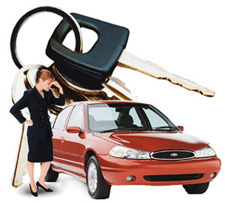 Automobile lockouts are very common, as almost all of us have locked our keys in the car at one time or another. It's stressful, because by the time you realize you're locked out, you usually don't have time to wait around. You timed your departure to make sure you'd be on time wherever you were going. But being locked out isn't the end of the world, and while a trusted mobile locksmith service can get you on your way quickly, we'd all like to avoid the inconvenience, stress and expense if we can. People prone to forgetting their keys sometimes keep a spare set in a magnetic case under the car somewhere, but since car thieves are wise to this tactic, there are some other practical ways to prevent automobile lockouts. Most have to do with establishing preventative habits. Start a new habit of checking for your keys. When you get in or out of your car, you already have a routine. You get in the car, put on your seat belt, put the key in the ignition, check the mirrors, etc. The simplest way to not forget your keys is to add checking for them to your routine. Try never exiting vehicle without them in your hand. You'll have to do it quite consciously at first, but after a relatively short time it'll become second nature and muscle memory. It'll feel odd not to have your keys in your hand, and you'll instinctively look for them before closing the door. Most automobile lockouts occur because something happened to break the routine. Whether it's a discussion with someone in the passenger seat or you set your keys down on the seat while looking for something, anything that breaks your routine puts you at risk of forgetting you keys. Just commit to your established routine and don't change it. Always keep your keys in your hand when you turn off the ignition, and leave them there until you're out of the car. Keep a spare key in your purse or wallet. Rather than keeping a spare key attached to the vehicle, try keeping one in your purse or wallet. This won't help if you forget your purse or wallet in the car along with your keys, but it does provide an extra safeguard. Keep a spare key at the office or other places you visit frequently. If you drive to work every day, or if you spend a lot of time at a friend's house, chances are good that you'll be at one of these places when a lockout occurs. If you keep a spare key at the places you visit most frequently, you're more likely to be within reach of a spare if you do get locked out. If despite your best efforts you find yourself out of the car and need quick, quality mobile locksmith service, Reno Sparks Lock & Safe can send a professional out any time of day or night. Call (775) 525-5712.